Ukrainian singer and composer Jamala, who won the 2016 Eurovision Song Contest with the song "1944," will give her first concert in Turkey on August 17 in Istanbul. Performing as part of the Turkcell Starry Nights Concert Series, Jamala will be singing at the Harbiye Cemil Topuzlu Open Air Theater. Expressing her sadness about the failed coup attempt of July 15 to journalists at the Atatürk International Airport in Istanbul, Jamala said: "May the martyrs [of July 15] rest in peace. I love Turkey. I feel at home here. I would love to see you all at the concert." Jamala had stated that she would dedicate this concert to 'democracy martyrs' who lost their lives while fighting against the coup attempt led by the Gülenist terror-cult (FETÖ). 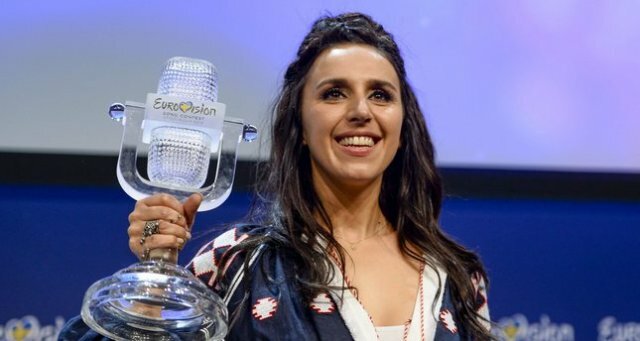 Jamala was declared the winner of the 2016 Eurovision in Stockholm on May 14 after a heart-felt performance of "1944", which was inspired by Jamala's great-grandmother's story, recounting the deportation of the Crimean Tatars by Soviet strongman Joseph Stalin. She sung the song partly in the Tatar language, she says because "it's in [her] blood." Jamala's entry -- which stirred controversy over perceived veiled criticism of Russia's recent annexation of Crimea -- scored 534 points. Over a span of three days in May 1944, Stalin deported the Tatars (Turkic ethnic group) thousands of kilometres to the east, where nearly half them died in the harsh conditions. Jamala's great-grandmother was in her mid-20s when she, her four sons and daughter were expelled, while her husband fought against the Nazis in the Soviet Army's ranks. In a journey that took several weeks, about 8,000 people -- mostly the elderly and children -- died of thirst and typhoid. Organized by Pera Event, the Turkcell Starry Nights Concerts, began on July 5 and will continue until the end of August. The concert series will host a total of 32 concerts this summer. Due to the intense interest shown in the concerts at the Harbiye Open Air Theater in Istanbul, this year's concerts are also taking place at the Open-Air Theater in İzmir's Çeşme district and the "Ancient Theater" in Muğla's Bodrum district.